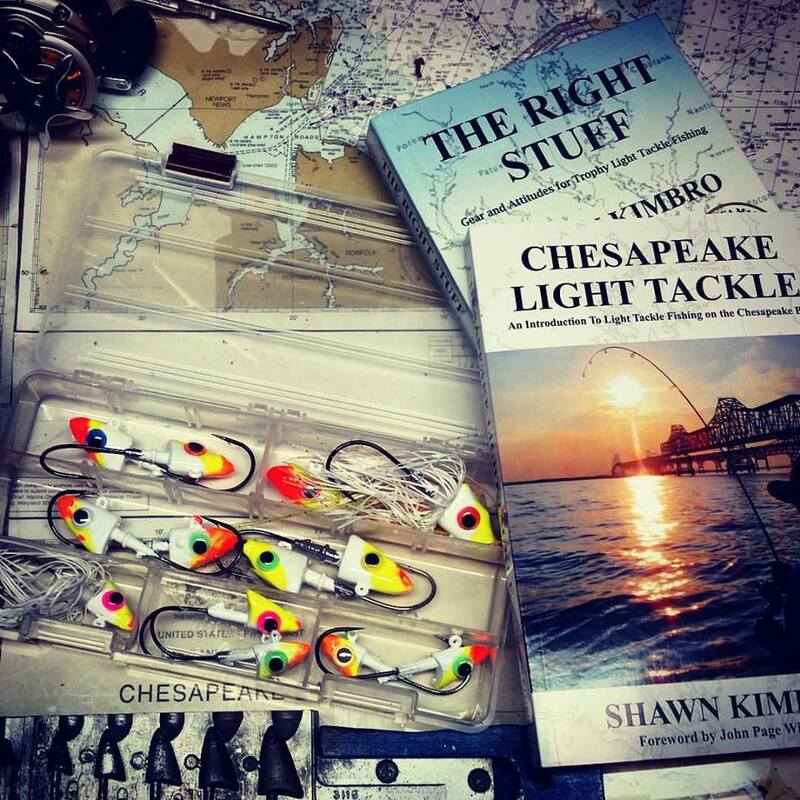 The people of Maryland deserve more from the agencies who are charged with protecting their fish. Today, leaders from the Maryland Coastal Conservation Association (CCA) met with Fisheries Director Mr. Thomas O’Connell and others from DNR in an attempt to persuade them to reduce harvest, not increase it. I am not optimistic. There is even talk of reducing conservation buffers in subsequent years so Chesapeake states can continue to harvest at present levels. In other words, they might try to get around ASMFC mandated cuts in 2015 by changing their accounting methods. We all understand the science behind the decision, but just because there are more young fish in the Bay from one successful spawning year doesn’t mean we should kill more, especially when stocks are threatened. I am including a letter CCA delivered below. 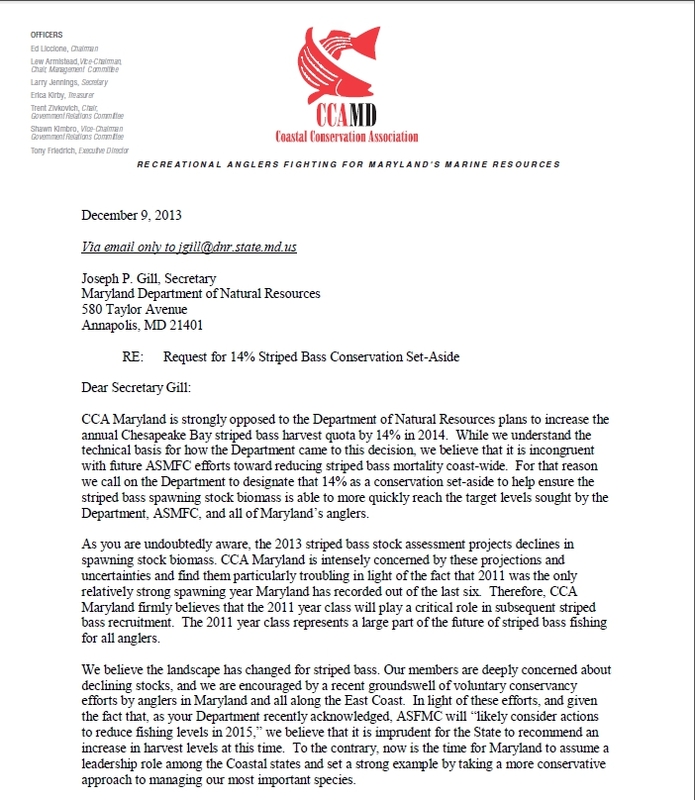 The letter calls for a 14% conservation set-aside for striped bass in 2014 from both the commercial and recreational sectors. Please help share this call for additional conservation. It could also be useful at this time to tag @GovernorOMalley and candidates who are running for Maryland Governor in any social media correspondence. Watch Facebook and Twitter for additional calls to action. Let’s hold our fisheries managers accountable for what we see as an egregious error and reserve ’14 for the fish. 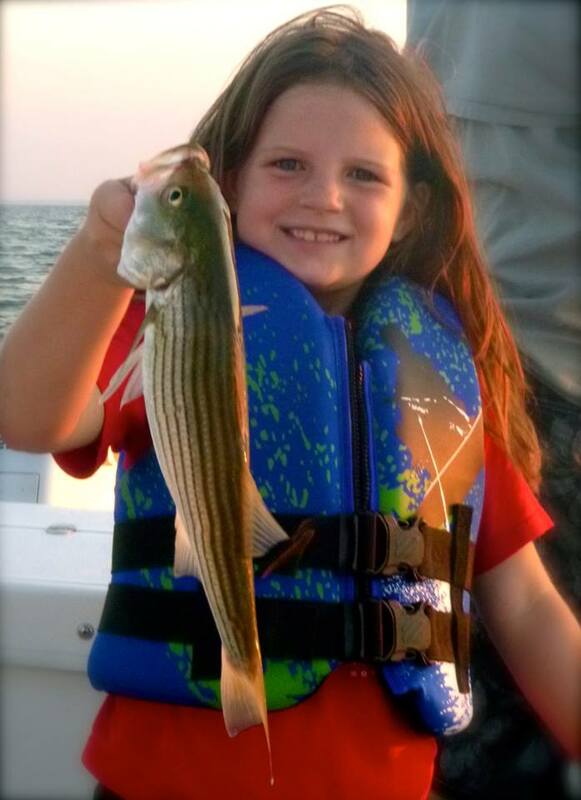 If we want there to be rockfish remaining for our children and grandchildren, we have to make it about how many we can save, not how many we can kill. 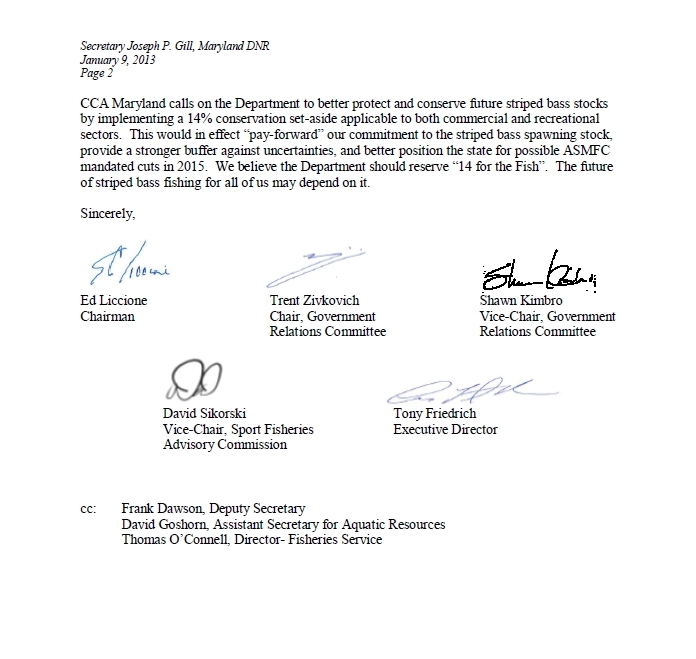 Bravo CCA Maryland and thank you for keeping this issue in the spotlight. It is unspeakable that DNR would do such a thing as this. Money talks. Mr. Kimbro, This is new DNR scetary Joe Gill’s first major fisheries decision so do you take it as a sign that he will have a anti-conservation stance on striped bass? Well said, such a shame when politics and money get involved in scientific based decision. I hope one day to see the same fishing I grew up with. That’s what I want to know. I expect big trouble with this new secretary. I suggest Mr. O’Connel take a look at some of the news comeing out of the northeast states this year, they’re really out of touch now. I’d rather keep it about the issue and not the personalities, but frankly, I’m not sure where Mr. Gill stands on conservation at this point. I suspect this is very much about appeasing pro-commercial-fishing delegates in the state house. Shawn, thanks to all for taking a stand. To gauge the DNR standard for action, I will quote from a Tom Horton section in Bay Country. Just want to tell you how much I appreciate CCA standing up to DNR on this. When you are right you have to take a stand. I also appreciate the strong stance of CCA and the significant amount of time and effort spent to meet with Fisheries Director Mr. Thomas O’Connell and write a letter. But, I think we are playing the game of politics with politicians — they will win. That’s my opinion. Politicians like letters, and meetings. They like money – which we have very little of. They like to keep certain things quiet and they do not like trouble. In 1965, now-Congressman John Lewis peacefully led 600 marchers across a bridge in Selma, AL. where he and others got the sh*t beat out of them by Alabama State Troopers. “Bloody Sunday” was captured on film and interrupted network television for 15 minutes. Today there’s a black president. I’m not black and I don’t want the sh*t beat out of me. But we don’t have to be as courageous as John Lewis to get things done. We just have to hit politicians and commercial fishermen where it hurts. For instance, boycotts get things done. I just took my wife to a cooking class at the Robert Morris Inn in Oxford, MD. Chef Salter cooked rockfish many ways. But what if we got Chef Salter to join a boycott of rockfish? What if we got other famous Bay-loving chefs to join in by posting signs, “We support the rockfish boycott”? What if the restaurants or fish markets who didn’t support the boycott had a bunch of A.N.G.R.Y. anglers show up and peacefully lock arms in front of their establishment refusing to allow delivery of rockfish? It might make the news and it might send a cold shiver up the back of the politician who’s face would be on the shirts we’d be wearing. I’ll buy the shirts! My emotions may have prompted me to write too strong of a previous post but a boycott of rockfish could be peaceful and extremely powerful. Cesar Chaves organized boycotts of lettuce and grapes making great strides for the United Farm Workers. Most everyone of a certain age remembers these boycotts even though they occurred decades ago, 3000 miles away. At the time it was said that “The farm workers’ greatest power continues to lie in the hands of ordinary people, who choose to participate in the boycott.” Why not boycott rockfish? Joe Fish have you seen how much money DNR spends trying to get people to eat rockfish. They even have a guy who goes all over the world trying to get more people to buy it. BillJacks I’m not certain what your point is. Is it that if DNR is paying people to eat rockfish and we oppose DNR then a boycott of eating rockfish IS the well-aimed strategy? I’ll add that it’s not just lettuce and grapes that have been effectively boycotted. Chefs in Calfornia began a boycott of Chilean sea bass when they became aware of extreme overfishing. As opposed to a boycott of crabs, which would put certain crab houses out of business, there are many alternatives when it comes to eating fish. BillJacks, I have concerns about all the money being spent on the seafood program as well and I’m not the only one. Maybe a subject for a different day. Joe Fish, I get the frustration. I’ve often wondered how many people would eat rockfish if they saw the bloody dripping myco sores we see on them. I’m hoping we can stay positive though and not turn this into a recs vs comms thing. If we just look out for the fish and manage them for abundance instead of harvest, I think things would improve all around.